A semi-truck carrying around 100 pigs overturned Monday afternoon on I-70. Five pigs were killed and the driver was transported to Valley View for injuries. Westbound Interstate 70 was closed for nearly five hours Monday just east of Glenwood Springs after a semi-truck carrying a load of pigs tipped over. The driver of the truck was taken to Valley View Hospital, 25 pigs perished and several more were hurt, Glenwood Police Chief Terry Wilson said. 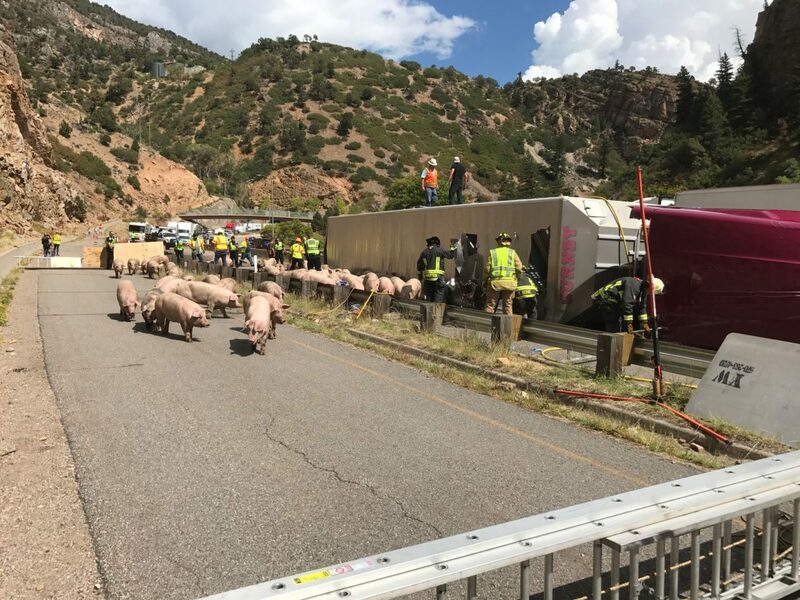 Glenwood Springs police and fire, Colorado Department of Transportation and others spent most of the afternoon trying to corral the 100 or so pigs that survived the wreck, routing them to the makeshift pigpen set up in the adjacent bike path. Just after 6 p.m., Wilson said that one lane of westbound I-70 was open and that the semi was back on its wheels, ready to be moved. He added that most of the pigs have been loaded and moved from the scene, though the dead pigs were still to be removed. The accident happened at about 1:15 p.m. at mile 117.5, just west of the No Name tunnel. It was a single-vehicle crash. CDOT reported that by 2:30 p.m., a veterinarian was on scene tending to injured pigs and helping to keep the rest calm. The truck driver lost control just west of the tunnel and hit the right guardrail before crossing the westbound lanes and striking the median barriers. The semi and trailer tipped over on its left side, Wilson said. Wilson added that the 25 dead pigs would likely be taken to the landfill.